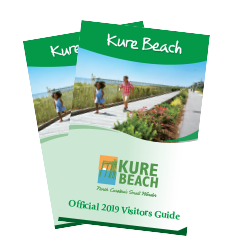 Check out the collection of recent news and headlines featuring Kure Beach to keep you informed on all of the exciting happenings around town. 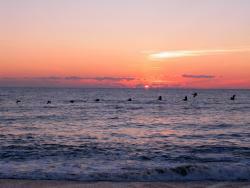 Life moves a little slower in Kure Beach, North Carolina. At this beach, families trade cars for bikes, choosing instead to take their time pedaling up and down the shores and fully embracing the salty air and the sound of the waves crashing against the rocks. That’s not to say this is a sleepy beach town — far from it. With brightly colored rental homes lining its shores, a historic Civil War fort, a state aquarium, and the oldest fishing pier on the Atlantic Coast, Kure Beach has plenty to offer families who prefer to make their vacations a little slower and a little sweeter. 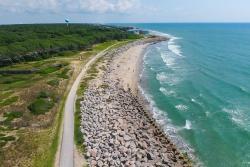 Of course, the best way to start off your Kure Beach vacation is by renting a bicycle and charting a course along the self-guide bike path to historic Fort Fisher and back. The scenic path follows the rocky shores, guiding you along the same routes that Civil War troops once walked more than 200 years ago. Take a break to walk through Fort Fisher State Historic Site and Museum. The historic fort was a crucial supply line through the Port of Wilmington for Confederate soldiers, but by 1865 it was the last remaining route available to Confederate troops. The downfall of Fort Fisher ultimately led to the defeat of the entire Confederacy. 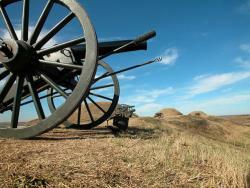 Today, visitors can tour the fort to learn more about the historic battleground. 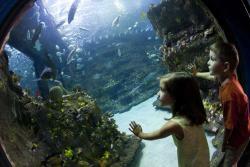 The North Carolina Aquarium at Fort Fisher gives stunning insight into what is swimming in and around the waters of Kure Beach and the not-so-far-away Cape Fear River. More than 2,500 animals call the aquarium home, including a rare albino alligator, a loggerhead sea turtle, and a 230,000-gallon tank full eels, sharks, and hundreds of exotic fish. It takes about two hours to enjoy the aquarium in its entirety, however, if you plan to enjoy some of the extended tours or presentations, you might want to add in another hour or so to your schedule. Just past the North Carolina Aquarium at Fort Fisher at the Southport Ferry port is another important Civil War site related to Fort Fisher that can be easily reached by bike. Next to the parking lot and down a short, sandy path, you can walk toward the historic marker where Confederate troops famously waved white flags from atop the sand dunes to surrender Fort Fisher to Union troops. The Southport Ferry port is also a popular point for fishermen and boaters and a unique vantage point for photos of Kure Beach. As you wind back down to the beachfront in the shade of the oak groves and through the Fort Fisher State Recreational Area, you’ll be back just in time catch the final rays of sun along Kure Beach Pier. Although there is a small fishing fee, it’s free to walk the 711-foot pier — and an absolute must for those who want a picture perfect shot after a day full of exploring one of the prettiest beachfronts in North Carolina. A special note for photographers: While you can&apos;t spot the sunset from the Kure Beach Fishing Pier, you can enjoy a pretty epic sunrise. Be sure to include an early-morning walk to your itinerary if you&apos;re an early riser.